Magdalene College was founded as a Benedictine hostel in 1428. It was renamed Buckingham College in the 1470s under the patronage of Henry Stafford, 2nd Duke of Buckingham. 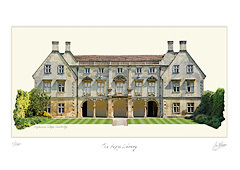 It was re-founded as the College of St Mary Magdalene in 1542 by Thomas, Lord Audley (Lord Chancellor of England). The arms of Magdalene, with the motto Garde ta foy ('Keep faith') and the crest showing the mythic wyvern, are all derived from Audley. agdalene Bridge, to the south of the college, stands on the site of the original town river crossing. The college has the longest river frontage of any of the Cambridge colleges with gardens running down to the River Cam from the back of the First Court buildings (the surviving parts of the original Buckingham College). Bright's Building was designed by Aston Webb and Ingress Bell in 1908-09 and houses Ramsay Hall which is used for dining and receptions.